Raccoon Holdings (TSE: 3031), Japan’s Leading B2B Online Wholesale Marketplace “SUPER DELIVERY” – H.E.R.O. Innovators Insights from CEO Isao Ogata | H.E.R.O. HeartWare | 8 April – H.E.R.O. What would an Asian online-only membership-based Costco Wholesale (NASDAQ: COST) boosted by artificial intelligence look like? What is the value of this “Asian online Costco” who innovated to become the only online wholesale marketplace in the world that combines a B2B ecommerce service with its own PayPal-like credit settlement payment and credit underwriting infrastructure which enables buyers to procure goods in bulk more easily through longer-term credit and allows sellers to focus on product development since they do not have to deal with credit payment risk themselves? Costco’s subscription model of 96.3 million loyal members generates over US$3 billion in fee income which flows straight down and contributes to over 60% of its operating earnings. The recurring fee and over 90% membership renewal rate make Costco’s earnings more predictable, propelling the warehouse club wholesaler to hit an all-time high in its market value at US$108 billion and a rare standout despite the dominance of Amazon. Both Warren Buffett and Charlie Munger have long spoke about their admiration for Costco which is also a Berkshire Hathaway stock holding and Munger is a board member since January 1997. This week, we highlight the under-the-radar listed Asian exponential innovator Raccoon Holdings (TSE: 3031), Japan’s leading B2B ecommerce service platform with its “SUPER DELIVERY” (https://www.superdelivery.com) wholesale marketplace connecting small-and-medium-sized suppliers, manufacturers, wholesalers (sellers) with small-sized retailers (buyers) in over 856,000 products (FY04/2016: 559,272) from fashion (apparel, accessories & jewelry), furniture & interior accessories to everyday household goods (kitchenware, stationary & crafts, daily necessities, toys & hobbies), electrical appliances and F&B/confectionery. Launched in Feb 2002, Raccoon’s “online Costco” marketplace focuses on companies who buy/sell in bulk and has 1,391 member suppliers (FY04/2016: 1,138) and ~119,000 member retailers (FY04/2016: 52,372), with an average purchase per retailer of over 247,000 yen while average sales per supplier is 2.2m yen, and commands a high ratio of repeat customers who repurchase within six months of over 94% and customer loyalty in which around two-thirds of member suppliers (sellers) use only SUPER DELIVERY for online wholesaling, thus differentiating from the typical loss-making and cash-burning B2C marketplaces with the need to spend aggressively on promotions/discounts/subsidies to attract fickle customers to expand GMV (gross merchandise value) in order to keep raising capital. Raccoon does not hold inventory and instead helps other companies reduce inventories by facilitating distribution. Raccoon generates both stable recurring monthly subscription revenue from suppliers who pay basic monthly fees of 40,000 yen and increase in transaction value in system usage fees (10% of each transaction) and from member retailers (buyers) who pay monthly membership fees of 2,000 yen. Raccoon is not charging monthly membership fees to overseas retailers (buyers) and Japanese buyers who are not retailers. Revenue from system usage fees comprised 63.3% of FY04/18 segment revenue, subscription revenue from member suppliers (sellers) 21.9%, and subscription revenue from member retailers (buyers) 14.4%. Raccoon is unique because it is the only company in Japan and worldwide that combines a B2B EC service (SUPER DELIVERY) with credit risk underwriting services (“PAID”, “T&G Credit Guarantee” & the fully online accounts receivable guarantor service “URIHO”). Member retailers can procure goods more easily since they have access to a wealth of product information and a system for buying with credit (through PAID), reducing the financial burden. Thus, SUPER DELIVERY is user-friendly to member suppliers in expanding sales channels even for first-time transactions with a buyer without taking on credit risk, eliminates paperwork in invoicing, and offers sales campaign management tools to target corporate buying groups. “We are striving to create and provide new ecommerce and credit settlement payments infrastructures for B2B transactions enable the carrying out of business with trustworthiness and ease of use. We will evolve into an infrastructure tool that small- and medium-sized Japanese manufacturers will use for global rollout,“ comments Isao Ogata 小方功, founder and CEO of Raccoon who owns 26.75% of the shares. With the community and compellingness exponential edge, Raccoon’s business model generates stable and recurring monthly subscription revenue and transaction fee, achieving a 45% and 62% absolute increase in sales and operating profit in the recent three years and generates decent profitability with EBIT margin of 18.3%, positive free cashflow margin of ~14.7%, ROE (= EBIT/ Equity) of ~21-22.3% and ROA of ~7-7.7%, propelling a 325% increase in market value in the past five years to US$114m. EC platform services business SUPER DELIVERY contribute around 66.6% and 51.6% of sales and operating profit respectively in FY04/2018, while financial services account for 33.4% and 48.4% of sales and operating profit. Transaction value marked an annual growth rate of 5.2% over the past seven years (FY04/2011 to FY04/2018). For FY04/2018, domestic retailers made up 90% of transaction value and overseas retailers 10%. In FY04/2018, the growth rate of transaction value for domestic retailers increased 2.6% YoY and overseas transaction value experienced higher growth (+67.8% YoY) to account for more than 10% of all transaction values (FY04/2016: 5%). On 6 March 2019, Raccoon announced its 3Q FY2019 in which 9M sales (May 2018 – Jan 2019) increased 14.6% yoy to 2.16bn yen and operating profit rose 17.7% yoy to 393m yen. Noteworthy is that Raccoon booked one-time expenses in (1) 100% acquisition of ALEMO (26m yen in brokerage fees and 11m yen in goodwill amortization) at the SG&A expense level and (2) Transition to a holding company structure (19m yen) at the extraordinary loss level. For cumulative 3Q FY04/2019, total transaction value increased 4.4% yoy, led by a 43.6% yoy growth in overseas transaction value which was blunted by 0.6% yoy decline in domestic transaction value. Raccoon also announced an upward revision in FY04/2019 results with sales revised upwards by 10% yoy to 2.98bn yen and operating profit revised upwards by 6.2% yoy to 545m yen. Balance sheet is relatively healthy with 2.275bn yen (US$20.5m) net cash (2.823bn gross cash and 548.66m in gross debt) which is around 16.8% of market cap. Management targets EBITDA of 1bn, around twice the level of FY04/18, at an early stage after shifting to a holding company structure in Nov 2018. Raccoon launched SD Export (https://www.superdelivery.com/en) in August 2015 to provide support to manufacturers who sought to export and sell their products overseas, not just in Japan, without undertaking complicated procedures. Raccoon is engaged in initiatives to expand its operation from Japanese member retailers to overseas retailers and Japanese businesses aside from retailers. SD Export had over 860 member suppliers (FY04/2016: 500) and more than 42,000 retailers (buyers) (FY04/2016: 5,000) in more than 180 countries. Raccoon sees overseas expansion as a growth initiative for SUPER DELIVERY because products made and designed in Japan are popular overseas. Total value of transactions going through SUPER DELIVERY during cumulative 3Q FY04/19 rose 4.4% yoy to 8.2bn yen; domestic transaction value was down 0.6% YoY for cumulative Q3 while the value of overseas transactions (SD Exports + overseas shipments placed on SUPER DELIVERY’s Japanese-language website) rose 43.6% yoy. Asia accounts for ~80% of the total value of distribution on SD Export. SUPER DELIVERY stands out not only because it is the only B2B marketplace that charges a monthly membership fee which encourages the retailers to stay active, but also because of its strict screening process (approval rate of about 30% as of April 2018), which looks at whether a retailer (buyer) has a high likelihood of procuring, such as verifying photos of store exteriors (which must carry visible signs) and merchandise on display, and if the applicant operates an online store, verify the website, store concept, and scale; member suppliers undergo inventory verification to improve the quality of its services. This process eliminates those companies who seek to resell the products and helps member suppliers (sellers) avoid credit risk. 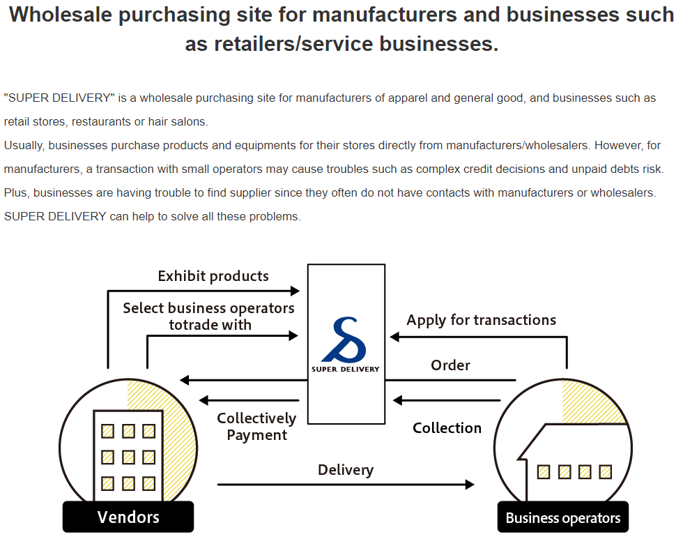 Participating suppliers (sellers) can expand their sales channels to small- and medium-sized retailers (buyers) both in Japan in different regional locations and overseas while minimizing operating costs incurred from traveling, creating catalogs, and exhibiting products and administrative costs since invoicing becomes unnecessary. SUPER DELIVERY has been praised for giving stores in regional areas access to the products available to stores in urban areas; over 70% of the member retailers are located outside of metropolitan areas like Tokyo and Osaka. In June 2016, the company won the First Nihon Service Award, a prize from the nation’s regional revitalization minister. The Nihon Service Award is Japan’s first award that recognizes businesses with outstanding services. Since July 2016, Raccoon has been working on lifting customer numbers and transaction value by extending its membership to include non-retail businesses in the restaurant, hotel, beauty and hair, lodging, and education industries. PAID (https://paid.jp) was launched by Raccoon in Oct 2011. 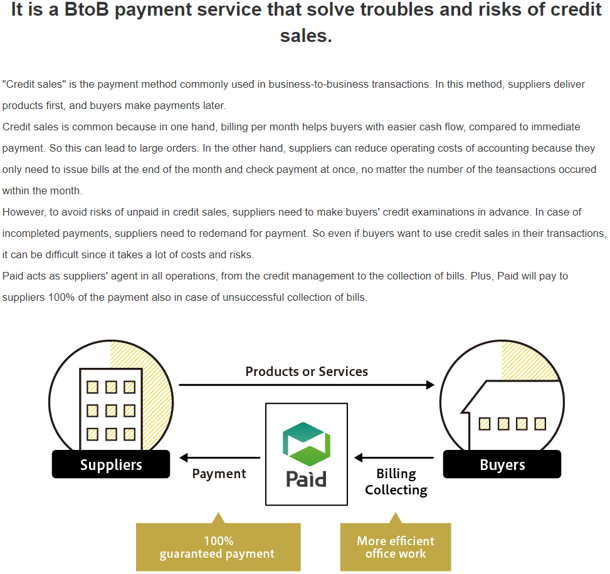 PAID independently handles the credit settlement function between companies and manages the entire process, from invoicing suppliers to collection of payment after products are sold or services are provided. Raccoon receives a guarantee fee (1.9% to 3.0% of the transaction) from the merchant seller, with invoices sent by the 20th of the month for payment due on the 25th of the following month. In FY04/18, 65.3% of SUPER DELIVERY’s transactions went through PAID. PAID has over 3,200 member companies. PAID is benefiting from an increasing number of clients ranging from startups with few employees to new businesses run by major corporations in various industries, since there is strong demand for streamlining payments. Internal transactions made up 29.6% and external transactions 70.4% (+33.7%) of the segment revenue in 3Q FY04/2019 with overall value of transactions growing 19.9% yoy to 16.8bn (vs 37.2% and external transactions 62.8% of the segment revenue in FY04/18. A variety of businesses and industries use the Paid service, including the apparel and merchandise, furniture, printing, and online services industries, as well as the Electric Vehicle Support service offered by Mitsubishi Motors (TSE: 7211). PAID introduced detailed credit screening and judgment using artificial intelligence from Jan 2018 using a deep learning system developed independently based on the unique transactions data of more than 200,000 companies: The credit review which required up to 2 business days by manual checks is completed by the introduction of AI in as little as 1 second; the credit limit initially granted to 80% or more of the companies has been improved, and the initial credit limit of the increased companies is more than doubled on average compared to before introduction. Raccoon uses the T&G Credit Guarantee service to guarantee accounts receivable in transactions between companies. T&G has accumulated much data on its customers since its founding in 2004. Raccoon has built up a highly-regarded track record and expertise in its credit underwriting service and in managing credit risk for small transactions by SMEs. The guarantor’s business T&G (acquired in 2010) is seeing higher revenue as Raccoon expands its services through operational tie-ups with regional financial institutions and improves the convenience of its products through package discounts on accounts receivable services. T&G’s accounts receivable guarantor service offers two plans: limited guarantee (limited to a predetermined amount during the approval process at 0.2% to 0.55% a month for an average of 4-5 months) and sales guarantee (the guaranteed amount is based on actual sales value at 1.2% to 3.0% of company sales). The guarantee fees are the sales of the accounts receivable guarantee business and are recognized in monthly installments over the guarantee period. Thus, the business generates recurring sales based on the balance of its total guarantees, and barring the occurrence of several large subscriber customers becoming overburdened by debt in a short period of time, the business yields an operating profit margin of 20% or more. OPM (including internal transactions) in FY04/2018 was 21.0% (23.3% in FY04/2017). Internal transactions made up 30.9% of the payments handled by the Paid service and external transactions made up 69.1% of the segment revenue in FY04/2018. External transactions also grew 26.9% yoy in cumulative 3Q FY04/2019. Most of the companies whose payments are guaranteed are small, with annual sales of 5bn yen or less, and most of the payment guarantees are also small, at 2–3m yen each. T&G controls the risk it underwrites by setting the guarantee amount limit for each buyer during buyer screening. T&G also works to diversify risk to minimize the effects losses on claims have on profit by (1) utilizing counter guarantees and offering products with disclaimers; (2) revising screening criteria for buyer companies as needed and working to curtail losses on claims. T&G also hedges its risks by applying a counter guarantee provided by non-life insurance companies. Raccoon also operates COREC (https://corec.jp), a cloud-based service for sending, receiving, and managing orders that was launched in Mar 2014 serving over 20,000 users vs 5,903 as of end FY04/2016. The freemium SaaS model charges subscribers 1,980 yen for suppliers and 980 yen for buyers. Raccoon is focused on gaining customers and improving visibility for COREC, so the service’s revenue contribution is limited. In March 2016, Raccoon began offering the COREC API service. Among the external partners with this service are Yahoo! Shopping, Square Regi, and Air Market. Raccoon looks to grow the service over the long-term by linking it with its other businesses, as some users who used COREC’s streamlined ordering then adopted the PAID service. Raccoon was also ranked in the “Great Place to Work” for three consecutive years since their first entry in 2017. Inspired by how new innovative ideas such as PAID, URIHO, COREC etc were developed internally, Raccoon formally established recently an intrapreneurship system to create new businesses, especially in utilizing AI and combining its accumulated data and expertise, and to support its next generation leaders. Thus far, of the 67 entrepreneurs and CEOs whom we had highlighted in our weekly research brief HeartWare, around one-third are in our focused portfolio of 40 HERO Innovators, while the rest are in our broader watchlist of 200+ stocks. “We are striving to create and provide new ecommerce and credit settlement payments infrastructures for B2B transactions enable the carrying out of business with trustworthiness and ease of use. We want to make Japan’s complicated wholesale business practices simple and concise and to streamline the distribution between manufacturers and retailers. I experienced myself the distributors’ difficulties in cultivating sales channels. From this experience, the thought of ‘Is there a mechanism to search efficiently retail shops across the country which handle products, a smooth distribution, and a secure settlement of accounts’ becomes the starting point of our business model. We have dealt with the problems on B2B transactions and developed the service available for each need on the basis of our mission, ‘Making Corporate activities more efficient and convenient.’ We will evolve into an infrastructure tool that small- and medium-sized Japanese manufacturers will use for global rollout,“ comments Isao Ogata 小方功, founder and CEO of Raccoon who owns 26.75% of the shares. Raccoon Holdings (TSE: 3031) is Japan’s leading B2B ecommerce service platform with its “SUPER DELIVERY” (https://www.superdelivery.com) wholesale marketplace connecting small-and-medium-sized suppliers, manufacturers, wholesalers (sellers) with small-sized retailers (buyers) in over 856,000 products (FY04/2016: 559.272) from fashion (apparel, accessories & jewelry), furniture & interior accessories to everyday household goods (kitchenware, stationary & crafts, daily necessities, toys & hobbies), electrical appliances and F&B/confectionery. Launched in Feb 2002, Raccoon’s “online Costco” marketplace focuses on companies who buy/sell in bulk and has 1,391 member suppliers (FY04/2016: 1,138) and ~119,000 member retailers (FY04/2016: 52,372), of which over 12,000 are active members with an average purchase per retailer of over 247,000 yen while average sales per supplier is 2.2m yen, and commands a high ratio of repeat customers who repurchase within six months of over 94% and customer loyalty in which around two-thirds of member suppliers (sellers) use only SUPER DELIVERY for online wholesaling, thus differentiating from the typical loss-making and cash-burning B2C marketplaces with the need to spend aggressively on promotions/discounts/subsidies to attract fickle customers to expand GMV (gross merchandise value) in order to keep raising capital. Raccoon does not hold inventory and instead helps other companies reduce inventories by facilitating distribution. Raccoon is unique because it is the only company that combines a B2B EC service (SUPER DELIVERY) with credit risk underwriting services (“PAID” and guarantor services “T&G Credit Guarantee” & “URIHO”) which allow suppliers to focus on product development since they do not deal with payment credit risk themselves. Member retailers can procure goods more easily since they have access to a wealth of product information and a system for buying with credit (through PAID), reducing the financial burden. Thus, SUPER DELIVERY is user-friendly to member suppliers in expanding sales channels even for first-time transactions with a buyer without taking on credit risk, eliminates paperwork in invoicing, and offers sales campaign management tools to target corporate buying groups. With the community and compellingness exponential edge, Raccoon’s business model generates stable and recurring monthly subscription revenue and transaction fee, achieving a 45% and 62% absolute increase in sales and operating profit in the recent three years and generates decent profitability with EBIT margin of 18.3%, positive free cashflow margin of ~14.7%, ROE (= EBIT/ Equity) of ~21-22.3% and ROA of ~7-7.7%, propelling a 325% increase in market value in the past five years to US$122m. EC platform services business SUPER DELIVERY contribute around 66.6% and 51.6% of sales and operating profit respectively in FY04/2018, while financial services account for 33.4% and 48.4% of sales and operating profit. Transaction value marked an annual growth rate of 5.2% over the past seven years (FY04/2011 to FY04/2018). For FY04/2018, domestic retailers made up 90% of transaction value and overseas retailers 10%. In FY04/2018, the growth rate of transaction value for domestic retailers increased 2.6% YoY and overseas transaction value experienced higher growth (+67.8% YoY) to account for more than 10% of all transaction values (FY04/2016: 5%). 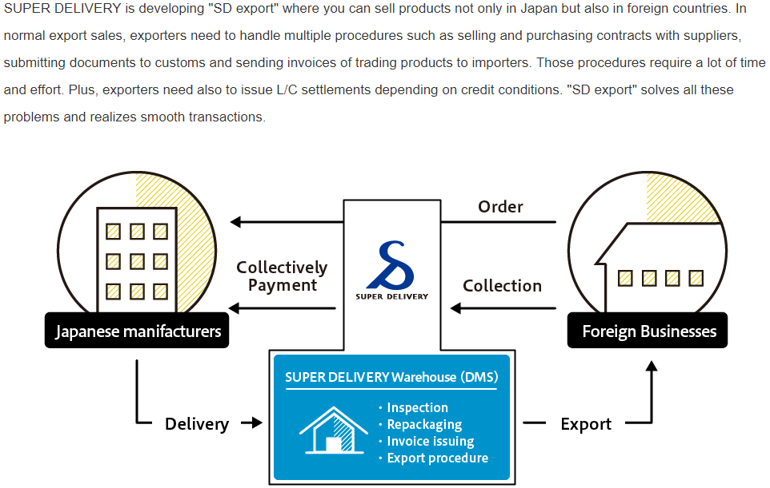 Raccoon launched SD Export (https://www.superdelivery.com/en) in August 2015 to provide support to manufacturers who sought to export and sell their products overseas, not just in Japan, without undertaking complicated procedures. Raccoon is engaged in initiatives to expand its operation from Japanese member retailers to overseas retailers and Japanese businesses aside from retailers. SD Export had over 860 member suppliers (FY04/2016: 500) and more than 42,000 retailers (buyers) (FY04/2016: 5,000) in more than 180 countries. To increase transactions and improve customer draw by making the payment system more convenient, Raccoon has made the SD Export site compatible with PayPal rather than its own PAID service. Raccoon sees overseas expansion as a growth initiative for SUPER DELIVERY because products made and designed in Japan are popular overseas. Total value of transactions going through SUPER DELIVERY during cumulative 3Q FY04/19 rose 4.4% yoy to 8.2bn yen; domestic transaction value was down 0.6% YoY for cumulative Q3 while the value of overseas transactions (SD Exports + overseas shipments placed on SUPER DELIVERY’s Japanese-language website) rose 43.6% yoy. Asia accounts for ~80% of the total value of distribution on SD Export. SUPER DELIVERY stands out not only because it is the only B2B marketplace that charges a monthly membership fee which encourages the retailers to stay active, but also because of its strict screening process (approval rate of about 30% as of April 2018), which looks at whether a retailer (buyer) has a high likelihood of procuring, such as verifying photos of store exteriors (which must carry visible signs) and merchandise on display, and if the applicant operates an online store, verify the website, store concept, and scale; member suppliers undergo inventory verification to improve the quality of its services. This process eliminates those companies who seek to resell the products and helps member suppliers (sellers) avoid credit risk. Participating suppliers (sellers) can expand their sales channels to small- and medium-sized retailers (buyers) both in Japan in different regional locations and overseas while minimizing operating costs incurred from traveling, creating catalogs, and exhibiting products and administrative costs since invoicing becomes unnecessary. SUPER DELIVERY has been praised for giving stores in regional areas access to the products available to stores in urban areas; over 70% of the member retailers are located outside of metropolitan areas like Tokyo and Osaka. In June 2016, the company won the First Nihon Service Award, a prize from the nation’s regional revitalization minister. The Nihon Service Award is Japan’s first award that recognizes businesses with outstanding services. However, while governance quality of the online wholesale marketplace is possibly the best in Japan, by targeting active retailers as customers due to the rigorous member screening, Raccoon has faced steady, healthy but suppressed growth. Since July 2016, Raccoon has been working on lifting customer numbers and transaction value by extending its membership to include non-retail businesses in the restaurant, hotel, beauty and hair, lodging, and education industries. PAID was launched in Oct 2011. PAID independently handles the credit settlement function between companies and manages the entire process, from invoicing suppliers to collection of payment after products are sold or services are provided. Raccoon receives a guarantee fee (1.9% to 3.0% of the transaction) from the merchant seller, with invoices sent by the 20th of the month for payment due on the 25th of the following month. In FY04/18, 65.3% of SUPER DELIVERY’s transactions went through PAID. PAID has over 3,200 member companies. PAID is benefiting from an increasing number of clients ranging from startups with few employees to new businesses run by major corporations in various industries, since there is strong demand for streamlining payments. Internal transactions made up 29.6% and external transactions 70.4% (+33.7%) of the segment revenue in 3Q FY04/2019 with overall value of transactions growing 19.9% yoy to 16.8bn (vs 37.2% and external transactions 62.8% of the segment revenue in FY04/18. A variety of businesses and industries use the Paid service, including the apparel and merchandise, furniture, printing, and online services industries, as well as the Electric Vehicle Support service offered by Mitsubishi Motors (TSE: 7211). Raccoon uses the T&G Credit Guarantee service to guarantee accounts receivable in transactions between companies. T&G has accumulated much data on its customers since its founding in 2004. Raccoon has built up a highly-regarded track record and expertise in its credit underwriting service and in managing credit risk for small transactions by SMEs. The guarantor’s business T&G (acquired in 2010) is seeing higher revenue as Raccoon expands its services through operational tie-ups with regional financial institutions and improves the convenience of its products through package discounts on accounts receivable services. Raccoon’s strategy is to increase revenue from guarantee fees by having more merchants (companies that receive payments) and PAID members (companies that make payments), which will increase the value of payments handled. Raccoon plans to increase transactions between merchants and PAID members by investing in systems development to improve user convenience. Raccoon provides the Paid B2B credit sales and invoice settlement service to competitors and multiple e-commerce sites. From June 2016, Raccoon began providing its PAID service to rival B2B EC website NETSEA, which is operated by Aucfan (TSE: 3674), and Zakka Net. Raccoon also provides PAID to companies offering services related to setting up B2B EC sites such as Hamee’s (TSE: 3134) NEXT ENGINE, Flight Holdings’ (TSE: 3753) EC-Rider Inc. and Lockon (TSE: 3690). In April 2017, Raccoon began offering PAID to GMO Payment Gateway (TSE: 3769). In June 2017, Raccoon began providing PAID as a payment method to businesses using the EC site operated by leading 100-yen shop Can Do Co. (TSE: 2698). Raccoon eliminates credit risk and paperwork associated with payments for the businesses that use these EC sites. In Nov 2015, PAID started serving the Shiirekan website operated by Yume (TSE: 2484), and in Dec 2015, it started offering its services on the LINE@ advertising service. In Nov 2018, Raccoon began offering PAID account settlement services for the long-term deferred payment option on Aperza which runs the Cluez online catalog site and the Aperza price comparison site focused on industrial supply products. In Jan 2019 Raccoon started with 24-hour/year-round service using automated deposit confirmation that shows PAID members their usage limit and allows immediate update of the limit, in response to member companies who are restaurants and retail operators who transfer after the closing hours of the store at night or on weekends which are treated as transfers on the next business day. Raccoon is building a system that allows buyers to become PAID members without creating additional labor for the merchants (sellers). Transactions via shopping cart accounts for about 80% of PAID’s handling volume. However, about 70% of the merchants are promoting Paid membership to the sellers face-to-face, which is inhibiting improvement of membership rates. In response, Raccoon is simplifying contracting procedures for new members in order to increase PAID membership rates (utilization rates) for face-to-face transactions, which is an issue for the company. Use of PAID became possible in all 88 VIVA Home stores (operated by LIXIL TSE: 5938) nationwide in April 2018 (preliminary operations had begun at select stores in July 2017). These stores offer an abundance of materials and related products to not only general customers but also professional customers such as building contractors. VIVA Home’s professional customers can now procure materials and related products across VIVA Home stores using PAID simply by presenting their Urikake Cards (credit payment card issued by LIXIL VIVA). In its Guarantor business, Raccoon’s subsidiary Trust & Growth (T&G) offers accounts receivable guarantor services and rent guarantees for commercial property in Nov 2010. T&G provides three main services: (1) T&G accounts receivable guarantor services; (2) the fully online URIHO accounts receivable guarantor service for companies with annual sales of 500m or less, (3) and rent guarantor service for commercial property. In B2B transactions, T&G guarantees creditors (sellers) collections on accounts receivable from debtors (buyers) that buy via credit sales. Raccoon also guarantees payment of rent arrears on commercial property. T&G charges sellers a guarantee fee and books those fees as revenue. If a buyer is unable to pay, T&G pays the seller in its stead. By using T&G’s guarantor services, sellers and rental property owners avoid irrecoverable debt, transfer credit risk to T&G, and reduce the work of collecting accounts receivable. Sellers can safely increase their transaction volume without taking on credit risk and do not need to notify buyers that their payments are being backed. T&G’s accounts receivable guarantor service offers two plans: limited guarantee (limited to a predetermined amount during the approval process at 0.2% to 0.55% a month for an average of 4-5 months) and sales guarantee (the guaranteed amount is based on actual sales value at 1.2% to 3.0% of company sales). The guarantee fees are the sales of the accounts receivable guarantee business and are recognized in monthly installments over the guarantee period. Thus, the business generates recurring sales based on the balance of its total guarantees, and barring the occurrence of several large subscriber customers becoming overburdened by debt in a short period of time, the business yields an operating profit margin of 20% or more. OPM (including internal transactions) in FY04/2018 was 21.0% (23.3% in FY04/2017). Internal transactions made up 30.9% of the payments handled by the Paid service and external transactions made up 69.1% of the segment revenue in FY04/2018. External transactions also grew 26.9% yoy in cumulative 3Q FY04/2019. Raccoon is steadily accumulating guarantees outstanding at 18.4bn yen in FY04/18 (FY04/2016: 9.1bn yen), including 1.7bn yen (9.3%) in guarantees outstanding for transactions within the group while external transactions made up 90.7%. Companies in various industries use the company’s guarantor services, although the service industry holds the largest share at ~31.4%, 26.7% in wholesale, 13.7% in retail, 12.0% in construction, and 16.2% in other industries. Most of the companies whose payments are guaranteed are small, with annual sales of 5bn yen or less, and most of the payment guarantees are also small, at 2–3m yen each. T&G controls the risk it underwrites by setting the guarantee amount limit for each buyer during buyer screening. T&G also works to diversify risk to minimize the effects losses on claims have on profit by (1) utilizing counter guarantees and offering products with disclaimers; (2) revising screening criteria for buyer companies as needed and working to curtail losses on claims. T&G also hedges its risks by applying a counter guarantee provided by non-life insurance companies. Sales channels are divided into direct sales and agency sales. Currently, about 40% of sales come from direct sales and 60% from affiliated partner agencies that include regional banks, insurance agencies, credit clearing houses, and other organizations. When an affiliated agency introduces a client, Raccoon pays 10% of the guarantee fee as commission to the agency. Competitors include factoring companies that are subsidiaries of major financial institutions which offer accounts receivable factoring, and eGuarantee (TSE: 8771) which offers guarantor services for corporations and financial institutions. T&G offers the only guarantor services that cover late payments, unlike its peers that only provide coverage when the debtor goes bankrupt. With this type of service, a seller can use T&G’s guarantor services to aggressively pursue new buyers and to prevent credit risk even from first-time buyers. 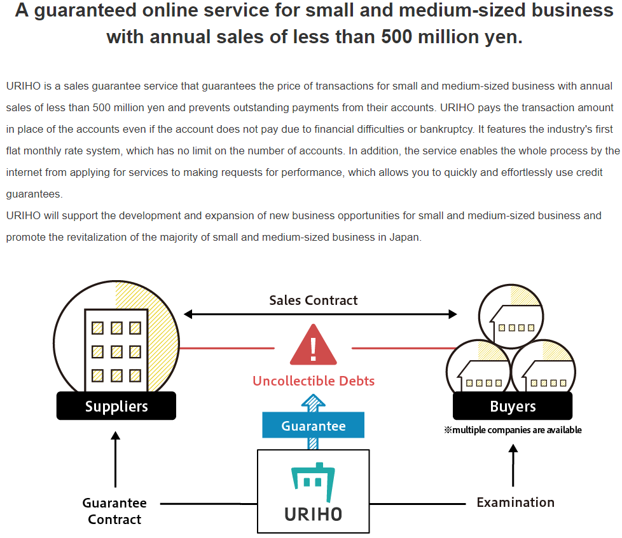 URIHO is a fully online accounts receivable guarantor service with a flat monthly rate system which can be used even by small to medium sized companies with annual sales of 500m yen or less (first of its kind in the industry). T&G launched the service in July/Aug 2016. Application, credit check, and execution can all be conducted online. Raccoon can now target companies, which its in-person guarantor service had not been able to before due to company size (companies with annual sales 500m yen or less; more than 80% of all companies). Small to medium sized companies making 500m yen or less in annual sales now have access to accounts receivable guarantor services, which it could not use before. This fully online accounts receivable guarantor services unique to Raccoon and are possible only because the company group possesses both the credit know-how in the Guarantor business and operational know-how for B2B EC business transactions. Since June 2017, Raccoon has been operating a commercial property rent guarantor service for businesses (retail stores, offices) through its own brand. Not only can a lessee rent the properties smoothly by using T&G services, but it can also create an environment that sets a lessor and property management company’s mind at ease to rent out the property. T&G’s rent guarantee service can provide a 24 months long-term guarantee service and cover the expense for recovering to the original condition, removing leftovers and applying for the enforcement of the lawsuit. Using the screening database and track record it cultivated as a guarantor specializing in commercial transactions, Raccoon will conduct full-fledged expansion of its rent guarantor service for businesses. Raccoon anticipates continued growth in demand in both the commercial and residential property rent guarantor market in the years ahead, as changes in Japan’s Civil Code that will go into effect in 2020 will make it even more difficult for individuals to act as co-signers on leases. Because rent guarantee services for commercial properties are yet not as widespread as rent guarantee services for residential properties and there is also less competition, Raccoon is looking to become a major player in this market by moving early to build up its market share. On Nov 2018, Raccoon entered into a business partnership with Global Trust Networks (GTN) to jointly develop and launch a rent guarantee service for commercial properties (stores, offices, warehouses, factories) leased to foreign tenants, foreign companies or foreign business owners that look to start or expand their business in Japan. The market environment for rent guarantee services for residential properties has grown more favorable in recent years as the aging of Japan’s population along with the growing number of single-person households and long-term foreign residents has led to increased demand for rent guarantees from companies rather than from private individuals. Coupled with the upcoming changes in Japan’s Civil Code in 2020, this points to continued growth in demand for rent guarantee services going forward. On 7 Dec 2018, Raccoon acquired 100% of ALEMO (https://www.alemo.jp) Inc. for 296m yen (270m plus 26m yen in brokerage commissions; FY09/2018 revenue 267m yen, recurring profit 33m yen, net asset 102m yen). ALEMO mainly operates a rent guarantee business for private residential properties located in the Kanto area and is enjoying steady growth in revenue thanks to its own multifaceted credit assessment system, which has allowed it to underwrite rent guarantees for a wide range of properties (including commercial properties) and deal with a number of different real estate companies. The acquisition will allow Raccoon to offer rent guarantee services for both residential and commercial properties. Such a service would be very convenient from the perspective of real estate companies that handle different kinds of properties, as it would allow them to use the same rent guarantee company for all their properties. As a result of the acquisition, the balance of rent guarantees outstanding at the end of 3Q FY04/2019 is 59.9bn yen (19.9bn of which was originated by Raccoon Financial and 40bn by ALEMO), a 258.2% increase over the end of FY04/18. Financial segment operating profit of 97m yen was up 36.2% YoY. Excluding the 26m yen in brokerage fees booked in connection with the acquisition of ALEMO, segment operating profit rose 73.3% to 123m yen. Following the transition to the holding company structure in Nov 2018, PAID, T&G, URIHO and ALEMO are consolidated under Raccoon Financial (https://financial.raccoon.ne.jp/yachin) headed by Akiyama Koji, while Raccoon Commerce (SUPER DELIVERY, SD Export, SD Factory) is headed by Wakui Takeshi. As at the end of 3Q FY04/2019, Raccoon’s allowance for doubtful accounts is 186m yen, an increase from 7m yen as at the end of FY04/2018, a result of the transition to the holding company structure. Before the transition, T&G guaranteed PAID’s business based on a guarantor contract. In cases of customer default, T&G would pay in place of the customer of Raccoon, with T&G recovering this in rights to claim compensation which is a net amount after deducting the allowance for doubtful accounts (72m yen in rights to claim compensation in FY04/18). Under the holding company structure, there is no guarantor contract, and the rights to claim compensation have become account receivables. SUPER DELIVERY competes with NETSEA which is operated by Aucfan TSE: 3674) and took over the DeNA B2B marketplace business from DeNA (TSE: 2432). As of April 2018, NETSEA had about 5,000 member suppliers (about 3.5X more than Raccoon), about 300,000-400,000 member buyers (about three to four times as many as Raccoon), and about 1.7m listed items. The screening process is relatively lenient, and Aucfan has adopted “Just three minutes to register” as one of its slogans. Since it is easy for companies with a low probability of making a purchase to join NETSEA, Aucfan’s transaction value is lower than Raccoon’s. Aucfan marked a transaction value of around 6.6bn yen in September 2017, while Raccoon’s transaction value in FY04/18 was about 1bn yen. In its guarantor business, Raccoon competes with eGuarantee (TSE: 8771) which was established as a subsidiary by Itochu Corp (TSE: 8001) for guaranteeing factoring companies’ financing receivables from e-commerce payments. Since eGuarantee offers guarantee services for low-risk major corporations, it has a lower guarantee rate than Raccoon. Raccoon and SUPER DELIVERY were founded in 1993 and 2002 respectively by Isao Ogata who owns 26.75% of the shares. Raccoon undertook three rounds of issuance of subscription rights to shares to raise 2.2bn yen in stages in accordance with improvements in business results, with each round having different exercise values with a premium placed on the stock price at the time of exercise with the exercise period between 24 Aug 2018 to 23 Aug 2021. The exercise value of the first round was 600 yen; the second round at 650 yen; and the third round is an amount not below 700 yen.